Cordless Tools make up the largest category in the 2018 edition of the Pro Tool Innovation Awards. That’s no surprise as it seems like every week there’s a new breakthrough—often in battery technology. With 21700 cells becoming almost commonplace, cordless tools can replace more corded tools than ever before. Still, other high-end tools are reaching DIY pricing. Add all that up, along with a brand new 12V player, and you have one impressive list of winners in the PTIA 2018 Cordless Tools Awards category. 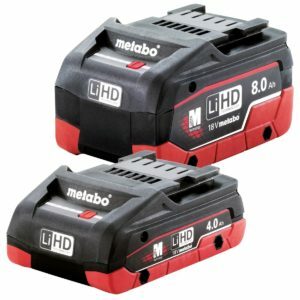 Metabo is the first power tool manufacturer to introduce the 21.700 Li-ion cells into a redesigned battery pack. Now, they’re the first to offer 8.0Ah of runtime in a standard pack format and 4.0Ah in a compact format. Together with Metabo’s patented battery pack architecture, the batteries have the ability to deliver a constant 1,600W through the discharge cycle without overheating. This new technology allows them to feed more powerful cordless devices than ever before while offering generous runtime. Metabo continues to lead the march in battery technology. Their Li-HD platform is expanding with a 2P 8.0 Ah pack and a 1P 4.0 Ah compact pack. They’re the first to get to those compact sizes, and you can thank 21700 cells for helping make it happen. Pack technology plays into it as well—particularly when keeping the pack cool on aggressive tools. No matter what battery platform you’re using, Metabo is still the one to watch when you want to see where pack technology is heading. The future of the construction industry is cordless technology. However, at times a corded tool is preferred for some applications. Up until today, cordless tools have never been powerful enough to meet the power output demand on a job site, and a corded adapter hasn’t been available or compatible. MultiVolt from Metabo HPT is the answer. It offers the power of a corded tool, the freedom of a cordless platform, and the choice to plug into an outlet—all in one tool. The new ET36AM is one of the first accessories in the MultiVolt lineup for Metabo HPT. For those times or applications when a corded tool is preferred, this accessory solves that issue and converts MultiVolt cordless tools into corded versions. The AC/DC Adapter is compatible with ALL MultiVolt tools. There is no power loss when connected to a generator or extension cords. Offering a 20-foot long cord, it gives plenty of room to move around a job site when power is available. As we see more corded tools fall to the wayside as cordless tools meet or exceed their power level, more Pros keep asking for hybrid power options. Metabo HPT (formerly Hitachi) answers the call with their ET36AM MultiVolt adapter. Now there’s no choosing between cordless and corded. Just grab the adapter for corded power when you want it, or stick with cordless power for the convenience. The DeWalt DCB104 4-port Fast charger charges up to 4 batteries at the same time with an 8-amp charge rate. Users are able to charge 12V, 20V, and FLEXVOLT batteries on the DCB104. The Charger comes with Tough System-compatible feet to lock into the various Tough System boxes and carts, allowing end users to plug in and keep batteries charged in an organized manner. Fast chargers are great, but it’s even better when your batteries don’t have to wait in line. DeWalt gives their users a 4-port fast charger—and each port can charge simultaneously. Best of all, you’re covered for 12V Max, 20V Max, and FlexVolt 60V battery packs with the same charger. The Milwaukee ONE-KEY Digital Platform for Tools and Equipment gives users the ability to access their tools and manage information at a level that has never been possible. This is provided by true connectivity to tools & other assets through an App available on either iOS, Android, or a web interface. While there are infinite possibilities on what One Key will be capable of doing in the future, the system currently has several areas of proficiency. You get simplified tool & equipment management and keep detailed records of each tool. You also get connectivity options for customizing, tracking, and managing any ONE-KEY compatible tool along with performance data. Milwaukee’s ONE-KEY system combines plenty of solid features. Tool tracking on Milwaukee’s mesh network ensures that anyone with the app on their phone will update the location of your tool. That works even when they can’t see it. The ONE-KEY Sawzall enjoys the best of ONE-KEY’s tool customization with material and blade selection for dialing in the best cut. For some, One-Key’s asset management side presents a great way to keep track of what tools you have, when maintenance intervals come up, what project each tool is assigned to, and much more—no matter what brand of tool or type of equipment it is. Milwaukee’s leadership in cordless technologies is reaching new bounds. They can now deliver solutions that were previously untouchable in the 18V space. Through a ground-up redesign of electronics, to the manufacture of a powerful new motor and a brand-new powerhouse—the M18 REDLITHIUM HIGH OUTPUT HD12.0 Battery—they created the world’s very first 18V large angle grinder. It not only features an aggressive 9” grinding capacity but does so while being much lighter than their industry-leading corded large angle grinder. Milwaukee also accomplishes this without asking users to equip two batteries or move up to higher voltage. It’s the ultimate boost to productivity! Milwaukee may not be the first company to bring a cordless 9″ angle grinder to the market, but they’re doing it on half the voltage. Using the new 12.0 Ah High-Output battery pack, you can get your hands on one of the most powerful cordless grinders currently available—and you’ll get the entire kit for less than $400. RYOBI introduces the new 18-Volt ONE+ Bolt Cutter. The hot forged steel jaws open to accommodate materials like chains, locks, bolts, fencing, and wire shelving up to 3/8 in. diameter and perform up to 200 cuts per charge using a RYOBI High Capacity Lithium+ battery. The innovative design minimizes hand and arm fatigue typically experienced with a manual bolt cutter. The clear sight line allows for optimal visibility of the cut area. Additionally, this tool features separated forward and reverse buttons for precision cutting control and repetitive cuts. The RYOBI 18-Volt ONE+ Bolt Cutter is backed by a 3-year warranty and is part of the Ryobi ONE+ family of over 100 tools. For your light- to medium-duty bolt cutter applications, it’s time to stop working out your arms and save it for the gym. Ryobi brings their first cordless bolt cutter to Home Depot with a 3/8″ cutting capacity and up to 200 cuts per charge. Value is a huge part of Ryobi’s focus, and the new bolt cutters will set you back just $99 as a bare tool. At 20,000 RPM, the Milwaukee M12 FUEL 3″ Compact Cut-off Tool has the cutting performance to tackle materials ranging from metal & steel to drywall & cement board and tile. Power comes from the POWERSTATE brushless motor paired with Milwaukee’s REDLINK electronics and REDLITHIUM XC4.0 battery. The one-handed, in-line design provides exceptional control in cutting applications while improving the line-of-sight to the material. While lithium-ion technology is allowing manufacturers to make bigger, more powerful saws, it also lets them go more compact for when you don’t need so much cutting depth. Milwaukee gives their new 3″ Compact Cut-Off Tool the benefits of a brushless motor and compact size with their M12 battery platform. Spinning the blade up to 20,000 RPM, thin metal, drywall, and cement board doesn’t stand a chance. The OCTANE Brushless 18V Hammer Drill/Driver features a high-performance brushless motor and advanced electronics, providing best-in-class power and intelligence when paired with an OCTANE battery. This tool provides an industry-leading 1,300 in.-lbs. of torque and over 65% more power in high demand applications, when paired with an OCTANE battery. With registration, this tool is backed by the industry’s only Lifetime Service Agreement. The Ridgid Octane line of tools were developed to get more from their batteries without jumping into bigger cells. They accomplished that goal and we see it in Ridgid’s new Octane Hammer Drill—a full-size hammer drill that delivers 1,300 in-lbs of torque. That moves Ridgid to the top of the drill torque hill, and they’re doing it with a $139 tool. New Skil Powercore 12V tools offer industry-leading battery technology. It delivers 25% longer runtime and 2X longer battery life. PWRJump charging means that 5 minutes gives you enough power to blast through 100 screws. PWRAssist lets the battery charge other devices with a built-in USB port. The tool also features a brushless motor, hybrid chuck, 350 in-lbs of torque, and LED light. This is one compact tool that’s packed with power! These new Skil 12V brushless tools look like they will turn the DIY/prosumer market on its head. They pack 350 in-lbs of torque into a compact drill/driver and give it a 1/2-inch chuck. Honing in on their target user base, the batteries have a built-in USB port to charge other devices when you’re not using the drill. Add the ability to get a 25% charge in just 5 minutes, and you’ve got the makings of a compelling new lineup. A variety of mud mixing solutions exists for drywall contractors, stucco, concrete, and tile masons. Many, however, are hindered by cords, and not a single one is a dedicated solution for the trades. With this in mind, Milwaukee engineered a mud mixing solution from the ground up as a dedicated solution for these professionals. From speed control to better functionality, the M18 FUEL Mud Mixer with 180° Handle is the first mixer designed specifically to address the needs of the trades. Engineered to tackle heavy compounds, such as concrete, it has the performance to fully replace corded mixers. Finally, professionals have a mud mixer that adapts to the way they work—increasing their productivity and mobility like never before. Pros have tried to figure out exactly what the limits are when it comes to mixing with a cordless drill. And the results are pretty unanimous—you eventually get a drill with a burned up motor. Battery technology, brushless motors, and better gearing finally give us the combination of low-speed torque and runtime needed for a legitimate mixer. Going beyond the “simple” ability to mix, you’ll notice the Milwaukee M18 FUEL Mud Mixer also takes a stand on mixer ergonomics, offering a rotating 180º handle that gives you more control in thick mixes. The Brushless 18V Drywall Screw gun kit offers 2-in-1 functionality with the included collated attachment to tackle a variety of applications. The Push-to-Drive technology uses a pressure-sensitive variable speed switch to control speed by pressing down on the tool, eliminating the need to stay on the trigger. This increases runtime while reducing user fatigue. The brushless motor increases runtime and motor life. With registration, this kit is backed by the industry’s only Lifetime Service Agreement. What’s most exciting about Ridgid’s new brushless drywall screw gun is the value proposition. You get a pressure-sensitive auto function, a brushless motor, collated attachment, two compact batteries, and a charger for just $199. Try checking off all the boxes and getting that kind of price from other manufacturers. For years, this market has been shifting to more compact magnetic drills, but no one has been able to deliver a solution for the user who has limited access to power, drills vertically or overhead, and regularly encounters thin metal. By utilizing M18 FUEL technology, Milwaukee addresses these issues by delivering the performance and run-time expected from most corded magnetic drill users. They also do this while eliminating the cord and maximizing productivity. The Milwaukee M18 Fuel Magnetic Drill Press is one of those tools that reminds me just how far lithium-ion technology has come. The fact that you can drill forty 13/16-inch holes in steel on one battery charge (more with the 9.0 amp hour battery) is impressive enough to stand on its own. However, additional features make it even better—like a permanent magnetic base that doesn’t lose holding power no matter the charge status. Or how about quick-change Weldon chucks that make this the portable magnetic drill you want to have above and beyond the fact that it’s cordless. The Ridgid MEGAMax family is the industry’s most powerful interchangeable tool system. The MEGAMax Brushless 18V Power Base features a high-performance brushless motor and advanced electronics, providing best-in-class power and intelligence when paired with an OCTANE Battery. The system currently consists of a reciprocating saw, right angle drill, and SDS-Plus rotary hammer attachment. The Heads all run off of the Power Base. With registration, these tools are backed by the Industry’s Only Lifetime Service Agreement. Ridgid’s new MegaMax multi-head system starts with the biggest brushless motor Ridgid has to-date in the power head. That gives them the flexibility to offer a stud and joist drill that also can swap heads for a reciprocating saw or rotary hammer. We bet your right angle drill can’t do that! Heat guns are frequently used by a wide variety of core user groups alongside other Milwaukee cordless solutions for many critical installation processes. Current solutions remain corded, large, clunky, and not optimized for the places where users need to work. This vastly impacts user productivity. The M18 Compact Heat Gun provides a solution with the M18 system promise to improve productivity for professionals in the trades. Making a cordless heat gun is a challenge if you’re going to stick with only a battery to produce that heat. After all, heat and batteries don’t play well together. Milwaukee scoffs at this obstacle and delivers a compact heat gun that reaches 875° F with minimum operational temps in just 7 seconds. When they introduced the original M18 FUEL drilling and driving solutions in 2012, Milwaukee solidified their leadership in this category by engineering the perfect combination of cordless technology and mechanical design in tools designed for the most demanding tradesmen in the world. For their third generation of drills and impacts, they’ve heavily invested in pushing the boundaries even further. Due to their research and investments, the next breakthrough in M18 FUEL drilling and fastening reveals a smaller yet powerful motor, more efficient electronics, and unmatched mechanical design that greatly reduces the size of both tools. Milwaukee’s latest breakthrough isn’t just about putting larger brushless motors on bigger tools. Smaller 18V tools are benefiting as well. The 3rd generation M18 Fuel Impact Driver keeps the same 2,000 in-lbs of torque and 3,600 RPM while dropping the size down to a truly compact form. When it comes to premium 18V impact drivers, Milwaukee’s M18 Fuel is among the best. Milwaukee Tool revolutionized the professional power tool market when they created the 12V sub-compact space with the introduction of the M12 system. They set the industry benchmark even higher when they launched the M12 FUEL drilling and driving solutions in 2013. They’ve continued to remain at the forefront of incredible technological advancements that have ultimately reshaped users’ expectations of cordless power tool capabilities. By pairing the newest cordless technologies with design features born from user-driven research, they’re setting the industry standard once again with the newest generation of M12 Drilling and Fastening products, designed to provide users with power and portability like they’ve never experienced before with a sub-compact solution! Like the M18 Fuel Impact Driver, the story behind Milwaukee’s M12 Fuel Impact Driver is a shrinking size that doesn’t reduce performance. With 1,300 in-lbs of torque, it’s among the strongest you’ll find on a 12V platform. Even though it drops almost an inch in length, the torque goes up by 100 in-lbs! An intelligent adaptive torque (AT) module equips the Hilti SIW 6AT-A22 impact wrench for controlled anchoring and bolting applications (fractional). The tool works in line with relevant ICC-ES approvals for wedge anchor installations. The new tool features a barcode scanner for easy, efficient setup while reducing opportunities for human error. It also allows the documentation of executed fastenings together with the AT documentation software for better accountability and back-office efficiency. Overall, you get controlled, repeatable impact-wrench-based installation of Hilti wedge anchors from 3/8” – 5/8” diameter. Hilti debuted this new tool at their 2017 Innovation Day, pairing it with updates to their 22V impact wrench. The big deal is the SI AT-22 Module which attaches to the tool. This allows you to scan specific Hilti concrete fasteners so the electronics can tell the tool exactly how to drive it correctly every time. That will save you a ton of time over going back to each fastener with a torque wrench to adjust your under and overtightened bolts until they’re within spec. Milwaukee Tool continues to broaden its offering of fastening solutions with the addition of the first cordless stubby impacts, allowing access in tight spaces while delivering the power to complete the most demanding tasks. The new 3/8″ and 1/2″ options deliver 250 ft-lbs of max torque, have 4-Mode DRIVE CONTROL, and are a mere 4.8″ in length. The new 1/4″ option provides 100ft-lbs of breakaway torque—giving users the ability to get into a compact space with the power of a larger 18V impact wrench. There’s a reason mechanics use stubby impact wrenches. Their size and profile make them great at getting into tight spots. Until now, there hasn’t been a really promising cordless replacement for light-duty pneumatics. Milwaukee’s new M12 Fuel Stubby Impact Wrenches offer up to 250 ft-lbs of torque and come in less than 5-inches in length. You’ll get the power and size you’re looking for without the hose dragging behind. The variety of cordless tire inflators available today have largely failed to deliver both the speed and range of capability required by users. These inflators are able to fill passenger tires but are unable to efficiently tackle more demanding applications. Our industry-leading cordless technology allows the M12 Compact Inflator to complete a wide range of applications from light truck tires (65-80 PSI) to compact equipment (10-80 PSI). As part of the M12 system, this tool also has the advantage of being completely compatible with the wide range of sub-compact tools available on this platform. We love our cordless inflators. Filling a 25mm wide bike tire takes just seconds. But when it’s time to fill our SUV’s tires, I might as well bring a book along. Milwaukee tackles the issue of slow filling with their new M12 Compact Inflator. It’s specifically designed to make filling light truck and small equipment tires faster while keeping the size and weight convenient to carry around no matter where the job takes you. Skil claims industry-leading battery technology, 25% longer run time, and 2X longer battery life. PWRJump Charging means that 5 minutes gives you enough power to blast through 100 screws. PWRAssist allows the battery to charge other devices with a built-in USB port. Tool features include 6-speed Auto Sensing, a Quick Release lever for fast, easy accessory changes, 3.6° oscillating angle for aggressive cutting, and a bright halo light. This compact tool is packed with power! Skil’s new brushless 12V line includes an oscillating multi-tool. More than just a tool to fit the space, this model features 6-speed auto-sensing technology that automatically adjusts to the work you’re doing. They don’t leave you in the hex wrench dark ages with accessory changes, either. Their quick-release lever system makes swapping accessories or changing blades and simple, fast process. At just $59.99, you’ll have room in your budget to add a few more members of the lineup before clicking “check out”. RIDGID’s new Bluetooth radios bring not just upgraded Bluetooth performance, but are also packed with additional key features. Both are RIDGID Radio App compatible, offering an array of benefits like weather updates and a battery charge gauge. The 18V Charging Jobsite Radio utilizes a dual-power supply so it can charge your batteries while you jam out. With registration, this kit is back by the industry’s only Lifetime Service Agreement. Ridgid’s first full-featured job site charging radio checks off all the boxes you’ve been asking for. The AM/FM radio is supplemented by a 3.5 mm aux input and Bluetooth connectivity. You can even charge your phone or device with the USB port. Speaking of charging—yes, you can charge your Ridgid 18V batteries when you plug the radio in. There’s also a really easy-to-use app that lets you control the radio function without walking back to do it manually. When we introduced our M12 Cordless Ratchets in 2011 we focused on replacing one of the most common hand tools in the world with a cordless solution that increased productivity for our users. However, a majority of professionals still used pneumatic ratchets due to the power output over the current cordless solutions. The M12 FUEL Ratchets make this a thing of the past. These new ratchets provide the industry’s first cordless replacement for a majority of pneumatic solutions. With up to 60 ft-lbs of torque, the most compact head design, and the industry’s first brushless motor in a ratchet, these tools help lead the shift in the marketplace from pneumatic to cordless. When it comes to replacing hand tools with cordless tools, Milwaukee’s M12 lineup stands on the front edge. The original M12 ratchets probably could stand on their own for a little while longer, but Milwaukee decided to push the envelope further with brushless motors. With 60 ft-lbs. of torque available and even better runtime and life, most mechanics, electricians, MRO crews, and plumbers can leave hand and pneumatic models back at the shop. When you take the time to consider the sheer amount of rivets needed during pre-fab, assembly, and field install work, it’s hard to believe that many users still rely upon hand tools that strain the wrists. Moreover, users who aren’t using hand tools are turning to pneumatic and have to deal with the ongoing maintenance of hoses and compressors. The technology behind the M12 System allows the creation of viable replacements for outdated solutions like these that have been used for years in certain applications, without compromising on power or functionality. Milwaukee is disrupting riveting applications by engineering one tool, designed specifically for the needs of the trades. As part of the M12 System, this tool also has the advantage of being completely compatible with the wide range of sub-compact tools available on this platform. In one of the more riveting competitions this year (sorry), Milwaukee’s new M12 Rivet Tool walks away with the win. True to the concept of using 12V tools to replace hand tools, you get 2,000 lbs of pull force for rivets up to 3/16″. According to Milwaukee’s internal lab tests, it takes 60% less muscle effort to pop rivets their way. At $299 for the kit backed by a 5-year warranty, it’s time to break up with your old rivet tool. DEWALT’s first 20V MAX XR Brushless Compact Router delivers power and performance for professional router users. It performs similar to a corded unit but with the convenience of cordless. A variable-speed dial matches the router application, and a rubber grip improves comfort. Finally, easy and quick height adjustments and dual LED lights for improved visibility round out the features. DeWalt is expanding their line of cordless woodworking tools, and we’re really excited about their new 20V Max router. This one promises enough power to get your trim routing done without a cord. It also has the build quality and feature set you expect on the Pro-level model. At $179 for the bare tool, DeWalt users are in for a treat. This new sander is the first DEWALT 20V MAX XR 5″ Random Orbit Sander. It features a DEWALT brushless motor which is more efficient and generates more power (vs 18V NiCad brushed motors) providing users with a comfortable, powerful sanding experience. The variable speed setting allows users to find the right speed for their application and easily adjust speed during sanding. Closer to the work surface than some other cordless sanders on the market, it provides more comfort during sanding. DeWalt’s 20V Max Random Orbit Sander has the features you want on a cordless sander. It includes an easy-to-reach variable speed dial and power switch, hook and loop pad attachment, and dust port with an included bag. Our team likes the lower profile that gets you closer to the sanding surface than other options. That should allow you to have a more consistent and smooth sanding action, leaving you with better results. Makita engineered the XSH04ZB circular saw for cutting and ripping applications. It’s ideal for contractors seeking a more compact cutting solution for framing, roofing, formwork, and more. It also fills the gap in the 6-1/2” cordless brushless circular saw category as a high-performing, blade-right saw. The Sub-Compact 6-1/2” Circular Saw has a compact and ergonomic design at only 10-5/8” and 6.4 lbs. Combined with the Makita-built brushless motor, it delivers up to 5,000 RPM with a superior power-to-weight ratio. Makita equipped the saw with Automatic Speed Change technology which adjusts cutting speed and torque under load for optimum cutting performance. The efficient brushless motor is electronically controlled to provide up to 50% longer run time than non-brushless motors, and in run-time testing, the XSH05 made up to 174 crosscuts in 2×10 SPF lumber on a single charge of the 18V LXT 5.0Ah battery. Makita bucks the trend of more powerful cordless tools by turning their attention toward more compact models. The new Sub-Compact Circular Saw gives you a 6.4-pound tool with a 6-1/2″ blade and 5,000 RPM of no-load speed. Essentially, it’s a solid 12V tool. The genius is that Makita keeps it on their 18V platform so you’re not buying into a new battery system. Whether you want to use a 5.0 Ah battery to extend your runtime or a 2.0 Ah pack to keep the weight as low as possible, this will get your smaller capacity cutting jobs done. Metabo just upgraded their well-known STA 18 LT in a new version offering a more compact body yet more robust performance. The new saw is faster and, thanks to advanced electronics, perfectly controls the cutting speed. With its variable speed dial, the woodworker can adjust the stroke speed to match the workpiece. The saw is available in a barrel grip shape (STA) or a bow handle design (STAB). More compact, more power, 4 modes for oscillation: everything one needs for clean cuts. Metabo’s 18V Jig Saw takes advantage of their Li-HD battery technology to give you up to 4″ of cutting capacity. Our team loves the integrated dust collection and that you can get well over 100 linear feet of cutting done with one compact battery pack. Combine it with Metabo’s 18V dust extractor for a 100% cordless solution. Not sure which model to get? Our team like the barrel grip. Makita’s 18V X2 LXT (36V) Lithium-Ion Brushless 10″ Dual Bevel Sliding Compound Miter Saw with AWS has an efficient 36V brushless motor powered by two 18V Lithium-Ion batteries for maximum power, speed and runtime, but without leaving the 18V LXT platform. For improved efficiency, the Auto-Start Wireless System (AWS) utilizes Bluetooth technology for wireless communication between the tool and dust extractor. When the trigger of the AWS-equipped XSL04ZU is engaged, the AWS-equipped dust extractor powers-up. When the trigger is released, the dust extractor powers-down. The direct drive gearbox with soft start is a key point of difference. Direct drive enables smoother start-ups and consistent, constant power with no belts to slip or replace. The electric brake provides added convenience. Additional features include a high-quality 40T carbide-tipped blade, a built-in laser that indicates the line-of-cut, and improved dust collection capability for use with a bag or vacuum. It also has a large-sized aluminum base that improves the stability of cutting stock for more efficient cutting. Makita really knocks it out of the park with their LXT 18V X2 10″ Miter Saw. It’s one of the first cordless miter saws we’ve used that just doesn’t feel like you’re using a cordless saw. There’s no compromise in cutting power and Makita’s direct drive motor transfers that power into some of the smoothest cutting action you can hope for in a miter saw—corded or cordless. As a bonus, you get AWS compatibility—a wireless system offering the benefits of auto-tool dust extractor activation for cordless tools. When it comes to heavy-duty cutting, there are few tools as iconic as the SUPER SAWZALL Recip Saw. Now, Milwaukee pushes SUPER SAWZALL performance even further due to the vast advantages of M18 FUEL cordless technology. The tool features a ground-up redesign of the electronics and the integration of a powerful new motor. It also highlights a brand-new powerhouse: the M18 REDLITHIUM HIGH OUTPUT HD12.0 battery. Milwaukee now has a cordless SUPER SAWZALL Recip Saw that not only meets the performance of the original—it blows it out of the water. When Milwaukee put the “Super Sawzall” name on their newest Sawzall, they got our attention. For a cordless model to keep pace with the 15-amp Super Sawzall, it’s got to pack a lot of power. The new 12.0 Ah High Output battery gives the M18 Fuel Super Sawzall the ability to truly jump ahead of current corded and cordless models on the market. Still holding out on cordless? You’re running out of excuses! At Milwaukee, M18 FUEL is a promise that each tool is engineered for the most demanding tradesmen in the world with the right combination of power, run-time, and performance for the tool and application at hand. Through a ground-up redesign of the electronics and the manufacture of a powerful new motor, Milwaukee created exactly the right blend of cordless technology to finally provide users with a powerful 18V table saw on the same M18 System they have relied on for years. It also helps that everything is powered by a brand-new powerhouse—the M18 REDLITHIUM HIGH OUTPUT HD12.0 battery. Until very recently, you couldn’t rely on your 18V/20V Max platform if you really wanted to cut the cord with a table saw. Milwaukee’s new High Output batteries and large frame brushless motors open the door for the M18 FUEL Table Saw. ONE-KEY is an added bonus. If you’re wondering how well an 18V battery can actually power a table saw, you need to give this a try. It’s surprisingly smooth and powerful! The Makita 18V X2 (36V) LXT Brushless 6-1/2” Plunge Circular Saw with AWS (XPS02ZU) delivers precise and more accurate cutting when combined with an optional 55” or 118” guide rail system. The saw and rail system work together to produce accurate cuts with minimal tear-out. The saw combines a powerful Makita-built brushless 36V motor powered by two 18V LXT batteries with Automatic Speed Change Technology which adjusts cutting speed and torque during the cut for optimum performance. For improved efficiency, it’s equipped with Auto-Start Wireless System technology. AWS utilizes Bluetooth technology for wireless communication between the tool and dust extractor. When the trigger of the AWS-equipped XPS02ZU is engaged, the AWS-equipped dust extractor powers-up. When the trigger is released, the dust extractor powers-down. The Saw has a variable speed control dial (2,500-6,300 RPM), with soft start and an electric brake for added convenience. It has a large 2-3/16” cutting capacity at 90 degrees, with a bevel capability of -1° to 48° and positive stops at 22.5° and 45°. When used with a rail system a Plunge Circular Saw is a more portable option to a table saw for select applications and is ideal for use on the job site or in a workshop. Makita takes all the best parts of their SP6000J and wraps it up with an 18V X2 plunge cut saw bow with no loss of power. If you check the card, you’ll see they added AWS as well. When you combine the saw with Makita’s track, you can leave your table saw for the framers and enjoy accurate, clean finish cuts, even on sheet goods. The vast majority of soldering options available to users right now come with various drawbacks such as uncontrolled temperature, slow heat-up time, and limited portability. When designing the M12 Soldering Iron, we focused on pairing the performance and temperature control of higher end benchtop soldering units, with the portability of butane. By leveraging our M12 technology, we’ve developed a soldering solution that eliminates the previous frustrations associated with current tools and ensures users experience improved productivity no matter the application. It’s a cordless soldering iron! While there have actually been a few of these on the market, most seem woefully inadequate next to the Milwaukee M12 Soldering Iron. It’s more than just having an option on Milwaukee’s deep line of 12V tools. The pivoting head allows you to work in positions where you can actually see what you’re doing since you can get your hand out of the way and into a more comfortable working position. The M18 FUEL 3-in-1 Backpack Vacuum brings unmatched performance, portability, and versatility to the job site cleanup category. A POWERSTATE Brushless Motor and cyclonic technology deliver up to 2X more suction than the competition, allowing users to clean up drywall dust, concrete dust, wood/metal shavings, and other common job site debris quicker and more efficiently. A quick release removable harness with integrated canister hook allows users to wear, hang, and carry the product for ultimate cleaning versatility on any job site. At only 76 dB(A), the vacuum is up to 3X quieter than a traditional job site vacuum, and the tool is powered by REDLITHIUM battery packs. You get up to 25 minutes of run time on a HIGH DEMAND 9.0 Battery Pack in High mode, and over 40+ minutes of run time in Low mode. What our judging team likes most about Milwaukee’s M18 Fuel 3-in-1 Backpack Vacuum is its inherent versatility. Obviously, being cord-free is a huge advantage right out of the gate. The ability to wear it as a backpack (and the fact that Milwaukee put together a solid frame and harness system for it) along with its ability to hang on a cart makes it easier to use than a rolling shop vacuum in many applications. The Hilti VC 75-1-A22 cordless 22V vacuum cleaner has manual filter cleaning, 1-gallon tank capacity, and 75 cfm of suction. It also features two power modes: eco and full power with manual filter cleaning to keep suction high. The Hilti VC 75-1-A22 vacuum has a robust housing and accessories that can withstand the harshest job site conditions. Its compact size and weight make it easy to carry. Moving from regular vacuums into the professional dust extractor class takes extra effort. If there’s anyone you can trust to produce a cordless solution that’s going to get the job done around concrete applications, Hilti has to be near the top of the list. They get 75 CFM out of their motor and sticking with a 1-gallon capacity makes it highly portable. Best of all, you know Hilti is working on not only Table 1 applications, but also developing Objective Data methods to make it easier to integrate this model into your arsenal. The new RYOBI ONE+ 6 Gal. Wet/Dry Vacuum lets you experience corded performance with cordless convenience. This vacuum has a powerful 80 CFM and features a multi-size no-tip wheel design and 360° mobility to keep your vacuum balanced when rolling over cords and thresholds. On-board accessory storage conveniently holds your crevice tool, floor nozzle, and extension wands, while the hose dock provides a simple solution to storing your hose when not in use. Multiple carrying handles allow for easy carrying, and the removable top lets you empty dust, debris, and liquids quickly and mess-free. Best of all, the RYOBI ONE+ wet/dry vacuum is part of the RYOBI ONE+ family of over 100 products. It might seem like a tip of the hat for Ryobi to bring a rolling wet/dry vacuum for their cordless user base. With all the available options, this may be the one you choose simply because of its convenience. There’s enough power to clean up sawdust, chips, and dirt, and all you have to do is check if there’s a battery in and turn it on. Not having to unwrap the cord, find an outlet, and wrap it all back up is easily trumped by the convenience we get from Ryobi.